The Federal Government has reacted to claims by former President Olusegun Obasanjo that it is plotting to silence him using false witnesses to indict and possibly arrest him. 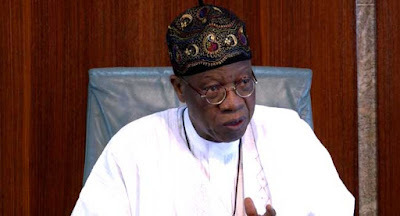 Minister of Information and Culture, Mr Lai Mohammed said in a statement on Friday that the allegations by the former President were frivolous and aimed at distracting the government. Chief Obasanjo, an ally-turned critic of President Buhari, made the allegations against the government in a statement earlier on Friday. According to a statement by his media aide, Kehinde Akinyemi, impeccable security sources have alleged that the former President’s name is on a watch list and that the security of his life cannot be guaranteed. “The operatives are daily perfecting how to curtail the personal liberties of the former President and hang a crime on him,” the statement added. Hours after the allegations, the Minister of Information and Culture said the Government was too busy try to fix the country and clear the mess created by past administration to think about framing anyone. ”This administration will never engage in a frame-up of innocent citizens. That is neither in the character of President Muhammadu Buhari nor in that of his administration,” a statement by the Special Adviser to the Minister, Segun Adeyemi, said. Obasanjo had called on the Federal Government to uphold the principles of democracy and to stop trying to suppress opposing voices. But the minister does not believe there is a need for that as the government is already operating democratically. To him, only those with skeletons in their wardrobe have reason to be afraid. “Only the guilty should be worried. To paraphrase an African proverb, a man who has no wife cannot lose an in-law to the cold hands of death,” he said. Furthermore, the minister suggested that the timing of the allegations and some others “were cleverly choreographed to divert attention from a widely-acclaimed presidential proclamation and to shore up support for a waning and egotistical cause”. According to him, it is curious that the frame-up and witch-hunt allegations came a day after a major presidential proclamation reversing some past acts of injustice was made, to the relief and acclamation of a long-expectant nation. ”Apparently, the impact of this proclamation was too much to bear by those who, through acts of omission or commission, helped to deepen the wounds inflicted by the blow of injustice that followed an election that was widely acclaimed to be free, fair and credible, hence they felt the need for a red herring that will distract the nation,” he said.